What Are Grassboarding and Kite Buggying? Home > Extreme & Unusual Sports > What Are Grassboarding and Kite Buggying? Despite boasting a sizeable number of ardent followers, both grassboaring and kite buggying are still relatively little known sports. Practised by both men and women, old and young, both sports allow the rider to get up close and personal with their chosen terrain and with the elements. Those who are keen to make the most of the rural and coastal landscapes the UK has to offer should certainly consider trying their hands at one of these extreme sports. Grassboarding goes by a variety of names, including mountainboarding, offroad boarding, dirtboarding and all-terrain boarding. Inspired by snowboarding, it is described by many as the fastest growing extreme sport in the UK. The grassboard features a deck, similar to that of a snowboard. The deck is fitted with bindings designed to attach the rider to the deck. The deck also sports four wheels with pneumatic tyres and a pair of trucks which facilitate steering. The grassboard or mountainboard may sound strikingly similar to the common snowboard or skateboard but, crucially, what differentiates grassboarding or mountainboarding from any other board sport is the multiple terrains that can be ridden. From manmade boardercross tracks to grassy hills, wooded areas to mountain bike trails, streets to skate parks, the grassboard seemingly knows no bounds. The extreme nature of the sport means that protective clothing is a must. Helmets, wrist guards, elbow pads, knee pads, padded shorts and body armour should all be invested in or hired. First time riders might like to consider visiting a mountainboarding centre in order to take advantages of the equipment, training and safety help on offer. Such centres are usually found in rural areas. Indeed, a day of getting to grips with grassboarding can be the ideal family day out when staying in the country. Furthermore, seeing experienced boarders displaying their skills and repertoire of stunts can prove a real inspiration, particularly for keen youngsters. Anyone who has taken a walk along the coast in rural areas in recent years has probably witnessed kite buggying. 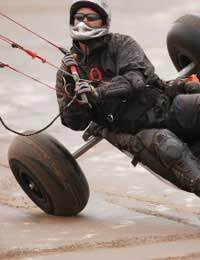 Unlike a grassboard, a kite buggy is a seated vehicle with one moveable front wheel and a pair of fixed wheels at the back. The vehicle is attached to a kite. The skill of the sport is to steer the vehicle to complement the movements of the kite above. Highly experienced drivers have been known to reach speeds of up to 70 mph. With this in mind, protective clothing is also a necessity on a kite buggy and a safety helmet must be worn. Some particularly brave drivers also practise buggy jumping. Here, the driver is attached to the buggy by a lap belt. Several large kites are used which the driver manipulates in order to generate maximum lift. The driver will be lifted up into the air on the buggy, sometimes up to tens of feat. Some adventurous drivers even perform tricks and stunts whilst off the ground. The British weather receives its fair share of criticism but both grassboarding and kite buggying are indebted to it. Riders and drivers work with the elements to perfect their sport and get their thrills. Both of these extreme sports can be a real buzz to try. It can also be exciting to watch experienced sports people on their grass boards or kite buggies. Whether taking part or simply watching in awe, it is well worth incorporating grassboarding or kite buggying into your trip to the countryside.